Affiliate Summit is the premiere conference for the Affiliate Marketing Industry. If you haven’t been to an Affiliate Summit conference, then you are really missing out on some major opportunities in Affiliate Marketing. Affiliate Summit takes place at least twice each year, on both coasts. In January, Affiliate Summit is in Vegas (yeah, baby! ), and in August the show is in New York City. New for 2012, Affiliate Summit is introducing a middle-of-the-year event that will be held in Austin. Do not miss Affiliate Summit. The networking is amazing, and invaluable to your business. The sessions provide incredible knowledge, information and education. The venues are always wonderful. The value – is, well – invaluable. If you are in affiliate marketing, then you need to be at Affiliate Summit. I promise: You will meet great people, you will learn invaluable information for your business, and you will go leave energized (maybe a little tired!) and ready to execute the tips, suggestions and lessons learned from Affiliate Summit. NOTE: I find these conferences so invaluable, that I’ve been to every single Affiliate Summit Conference since they started, with the exception of only 2 due to scheduling conflicts that prevented me. 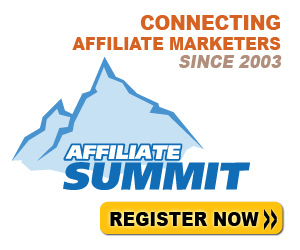 Affiliate Summit provides recordings of many sessions from previous years available for free.